Joshua Tree Oasis. Come Refresh Your Spirit! An excellent and affordable year-round California vacation home rental, it's perfect for exploring California hiking trails, as a base for your rock climbing expedition, mountain biking, or just relaxing in the jacuzzi or cowboy spa under the stars! Joshua Tree Oasis sits on a bluff overlooking thousands of acres of high desert, bordering Joshua Tree CA National Park. Built into the side of a mountain and totally secluded, Joshua Tree Oasis offers 360-degree birds-eye views of incredible desert landscapes, botanical and animal life, amazing sunsets and with outdoor activities that have made this sanctuary legendary.The Joshua Tree Oasis is an affordable Joshua Tree National Park vacation home rental so please do not hesitate to contact us if you want to get away and visit this magical California vacation home location. It started years ago with a dream in the desert, a small house in the middle of nowhere overlooking thousands of baron acreage bordering Joshua Tree National Park. When Ethan and Fabiane purchased the home, it was initially painted all white with minimal landscaping and described by friends and family as a “sterile box without personality.” But what they envisioned was a house of infinite possibilities. As avid rock climbers and desert dwellers, they looked at their home as part of the desert; a living and breathing organism. They brought in top designers and landscapers to mirror the conceptual mix of colors of the desert, blues and greens representing the sky, yellows and reds like the sunrises and sunsets, and browns and tans like the mountains. They named their home Joshua Tree Oasis (JTO) and took great pride in their life-long creation. Being big believers in Karma and the feeling that the beauty and love that they poured into the house would be reciprocated, they opened their doors to the world and began to share their Oasis as a vacation rental with others. They only wanted renters they felt would love and respect JTO’s appearance and cleanliness as much as they did. They take great care to get to know their clientele and will personally speak with each customer prior to renting to them to begin a relationship based upon mutual trust. With many years of Joshua Tree Oasis management, this husband and wife duo have learned what it takes to make guests happy and coming back for more. They know that no matter how wonderful a person’s home may be, you need a trustworthy team to supervise the flawless rental for both host and renter alike to guarantee rental success. The house, grounds, and location are all better in real life than they are in the pictures. We were a group of seven and were very comfortable. We all had a great time and are looking forward to coming back in the future. Our family of 6 had a relaxing and enjoyable time at Joshua Tree Oasis. The home is situated a short drive outside the Joshua Tree Park entrance. 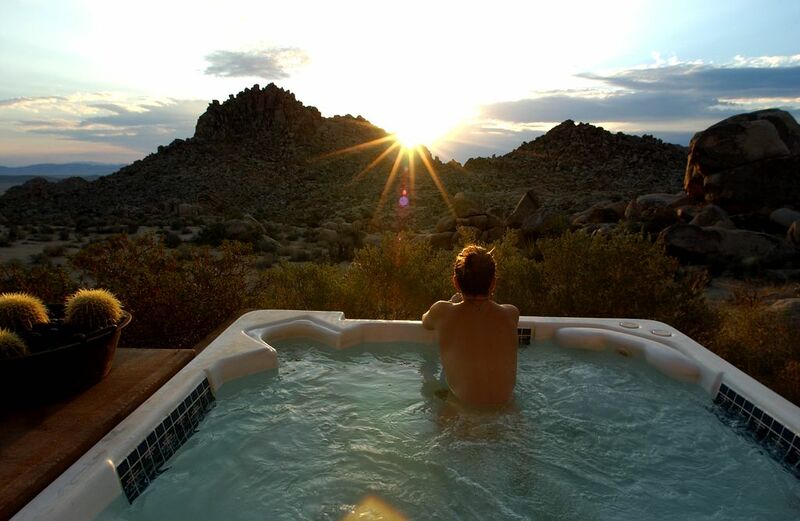 JTO provided a great place to enjoy breakfast in the morning, pack lunches for hiking during the day and a relaxing hot tub at the conclusion of each day. The wildlife right outside the door is fantastic and the morning sunrise is breathtaking. Highly recommend and look forward to a return soon. We've stayed at several excellent vacation rentals in Joshua Tree but nothing compares to this one. The setting is extraordinary and the attention to detail on the property itself, both inside and out, is first-rate. The aesthetic is extremely well-honed and the Owners have thoughtfully provided all the comforts of home, and more, even though it feels like you're in the wild. This is, in fact, a neighborhood, not far from the charming shops and cafes that surround the Park, but sitting in the hot tub or enjoying a cup of coffee on the patio, you'd never know it. This is the getaway of all getaways. When you experience it, you'll understand and respect the need for the detailed list of instructions sent ahead of your stay. Prepare to take a ridiculous number of photos. This spot was such a lovely place to relax when not enjoying the wonders of Joshua Tree National Park. The all natural views from the back patio were my favorite: the wonderful jumble of rocks that you might expect but with a view off into distance that was delightful. Loved sitting quietly outside while the sun came up (easy to do with a body still adjusted to East Coast time). I loved how it could fit four or eight people comfortably depending on how many in your party but with a lower price for fewer people. The decorating style was quite unique. We had multiple generations with my mom and dad (80’s), my husband and I (50’s), and my daughter (20’s) and enjoyed cooking meals most nights in a kitchen fully stocked with all the pots, pans and utensils one would need. We would stay here again! My husband, three year old and I loved our stay at Joshua Tree Oasis. The space was perfect for our little family. It was fun to watch the birds in the morning and the sunrise is so pretty. The pictures don't do the space justice. The kitchen was well equipped for making meals, the beds were comfortable and there was plenty to do if we decided to stay in. We played hide and seek and enjoyed exploring the back yard. The hammocks were delightful as well.